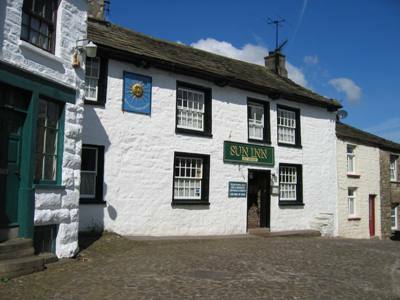 The walk uses the Saturdays and Summer Sundays only Dent Station - Dent Village bus link which is timed to fit in with the northbound morning train service - This is an excellent service which continues to Kendal via Sedbergh. Note: this would be a 14 mile circuit via Dent if the bus service is not used. 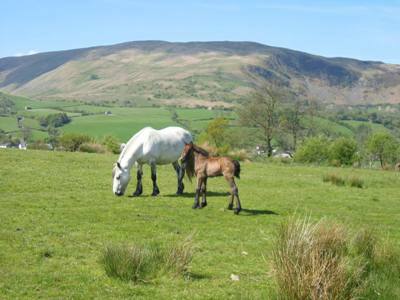 From Dent Station walk down the steep Coal Road to Cowgill. At the T junction turn right towards Dent and continue for 400m or so. Just before Cowgill Church turn right up a dead end lane with Cowgill Beck on left, This is in fact the bridleway to Garsdale. The tarmac soon disappears and the track crosses Docra Bridge becoming a steep rough track proceeding up through the trees. The gradient eases a bit as the views open out to see Dent Station on the other side of the valley! There is no short cut across here! Progress to the top of the hill through a gate. The track has been deeply rutted in the past by 4x4 vehicles which have now been prohibited. Shortly after the gate and on the crest of the hill there is a new stile in a corner of the open rough pasture. 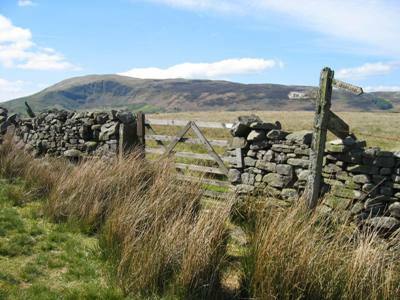 Turning left over the stile proceed uphill with the fence on the right to meet the edge of a plantation. Now in a short section of path enclosed between the wall and a fence to the plantation proceed to a further stile. This is the top of Snaizewold Fell and a limestone outcrop. For the next 2.5 miles follow the path with the wall on the left and in a westerly direction. The path crosses several broken down walls whilst steadily gaining height. A rocky area will be noticed on the right with evidence of mining in the past. 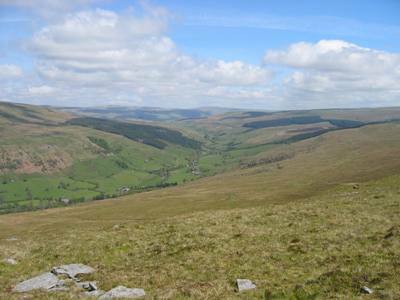 There is a good vantage point into Garsdale and onto the Howgills here. 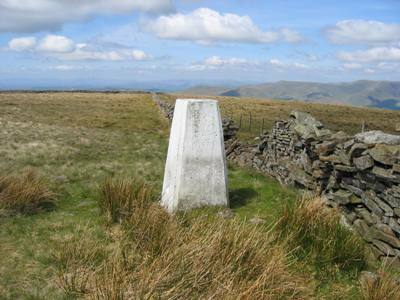 Continuing a short distance and after a slight uphill the trig point of Aye Gill Pike will come into view on the other side of the wall and over a stile. This is a good place to stop with the wall as shelter. On leaving the trig point pass back over the stile to continue with the wall on the left for another 1.5 miles. This proceeds generally downhill with a two stiles enroute. The first of these is poorly constructed and so care will be needed when descending. As the track levels out and just after a lone tree turn left through a gate and onto a bridleway towards Dent. Pass through another gate and as the track bears right downhill look out for a small gate in the wall on the left. Cross a small stream and keep to the right hand side of the rough pasture. This passes through a gate at the top of a slight uphill with some trees just in front. 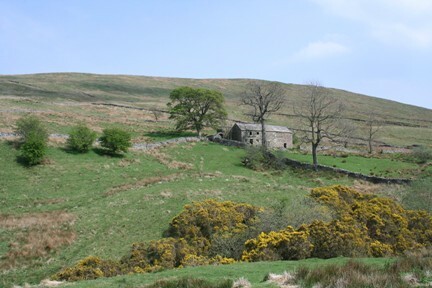 Beyond is a disused building known as Roantree. However bear right down the hill to a ford and then pick up a farm track towards Hacra closely following the stream. Pass through a gate at the bottom of the hill turn and then sharp left through a sheep pen. Now cross four fields in succession, the final stile being located within some trees with a waymarker nearby. Passing through the stile bear slightly left for 200m passing to the left hand side of the stone barn and then right into a an enclosed track. As the track appears to come to an end look for a stile on the left. Now pass through a further four fields towards High Hall. There is a recently constructed lake to encourage wildlife enroute. 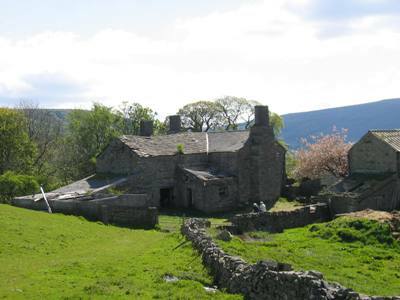 The path now descends towards High Hall an impressive stone Lakeland style farmhouse sadly now in poor repair. Pass through the gate to the right of the farm house and through the farmyard. Now proceed along the farm track passing Low Hall and down to the aptly named Flood Lane at the bottom. Turn left along the lane. After 300m look for a stile in the wall and turn right to follow the River Dee. The path now emerges at Church Bridge. 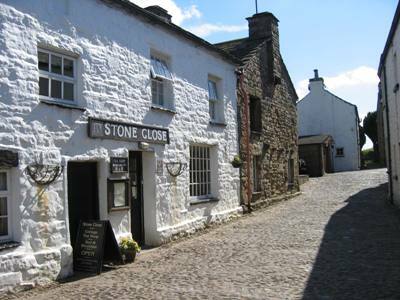 Turn right and follow the road into Dent for refreshment in one of the several cafes or two pubs. 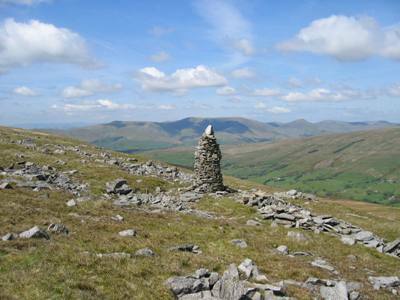 An alternative would be to carry straight on along the crest of the hill crossing Frostrow Fell to get to Sedbergh. This meets a farm access road at Side farm however there a number of footpaths which could be used to avoid a road walk into Sedbergh and perhaps follow the Clough River to Garsdale Bridge and then the Rawthey. 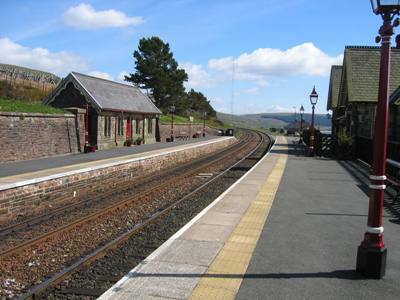 The distance either way is about the same and the bus can be caught from the Dalesman at Sedbergh.